The sweet smell of borscht will be in the Pittsburgh air soon, as the familiar, friendly faces of fan favorites Vladimir and Natalia Malkin will be returning to the city tomorrow, according to their hockey-playing son (via the PG's Empty Netters blog). If you need a briefing on the enthusiastic parents, I recommend this article as a starting point in your Malkin family history. You'll also want to check out Mama Malkin's borscht recipe (Evgeni's favorite) and this classic moment from last year's playoffs when Vladimir celebrated one of Evgeni's goals by hugging a blonde who was not his wife. Big mistake. Regardless of past errors in celebrations, it's fantastic to have the Malkins back in town. The playoffs have now officially begun. 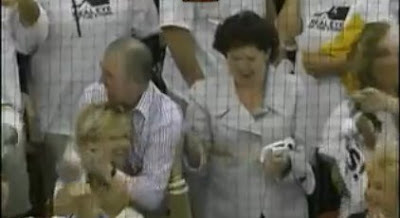 The blonde who Vlad was hugging was Geno's GF. I don't think there was a real problem there. It's not like he took her into a bathroom stall...or is it Staal?